Yahoo really wants U.S. Firefox users to stick with Yahoo as their default search engine. So much so, the company is willing to provide everyone else a sub-par experience on the desktop. Yahoo’s deal to be the default search engine in Firefox is nearly a year old and over that time Yahoo’s search market share has crept up and down. Now, the company is trying to use exclusive features as a way to entice more U.S. Firefox users to stick with Yahoo. 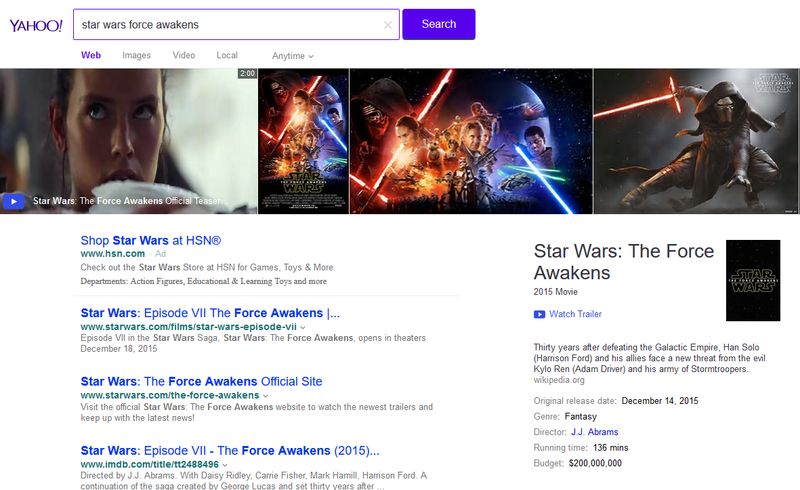 Anyone in the U.S. searching for items such as movies, songs, and sports from the Firefox Awesome Bar or search box will see a new search layout on Yahoo. The most obvious change is that the top of the results page now has a banner of images and video related to the search. Yahoo’s new search layout is exclusive to Firefox users in the U.S. who use Yahoo in the Awesome Bar or search box. Below that, Yahoo gathers what it says are the most relevant search results. 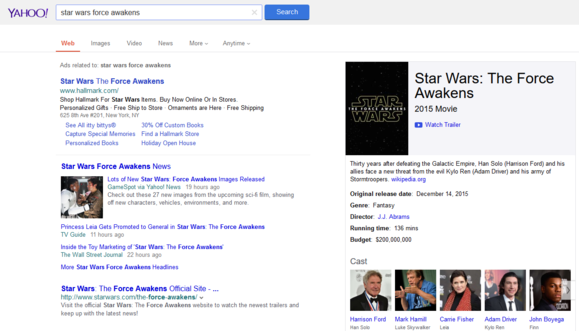 Search for movies, for example, and you’ll see links to IMDB and Fandango up front. Search for your favorite sports team or athlete and you’ll get stats, upcoming games, and other relevant data higher up in the results. Yahoo’s less colorful non-Firefoxian search results. Putting the most relevant information at the top of desktop search is similar to Yahoo’s recent changes with its mobile search product. To be clear this isn’t a new feature exclusive to all Firefox users in the U.S. If Google is your default search engine in Firefox and you search on Yahoo.com your results will be no different than if you were using Chrome, Edge, or Safari. The new features are exclusive to Firefox users in the U.S. who have Yahoo set as their default search engine in Firefox and who search from either the Firefox Awesome Bar or the browser’s search box. 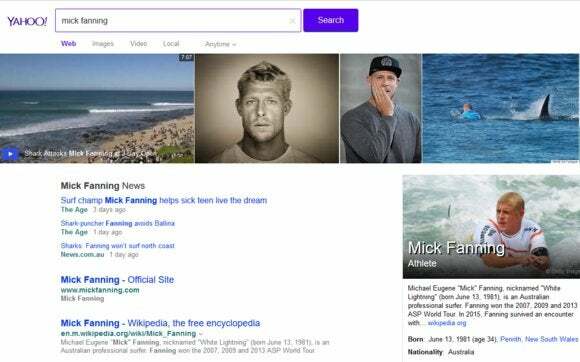 Even if Yahoo is set as your default search engine in Firefox, an initial search conducted directly on the Yahoo.com website will not yield the new layout and search results. Why this matters: Yahoo clearly wants to make the most of its search deal with Firefox, and enticing more users to switch to your product with exclusive features is nothing new. Yet Yahoo’s approach here is borderline bizarre. Wouldn’t you want as many users as possible to have easy access to the most relevant information from their search? Why make a standard improvement like this exclusive to Firefox unless it fulfills some contractual obligation? This is a really strange development and I’d bet this “exclusive” feature will not remain so for long.